Summer is finally here! I’m serious, temperatures are set to hit a whopping 29ºC all across our sunny isles this weekend and what better way to celebrate the sun than with some seriously sunny scents? My post for Escentual this week focuses on two scents I am quite liking for summer: Guerlain’s Aqua Allegoria Nerolia Bianca for the girls and Dior Homme Cologne (the new 2013 version) for the boys. 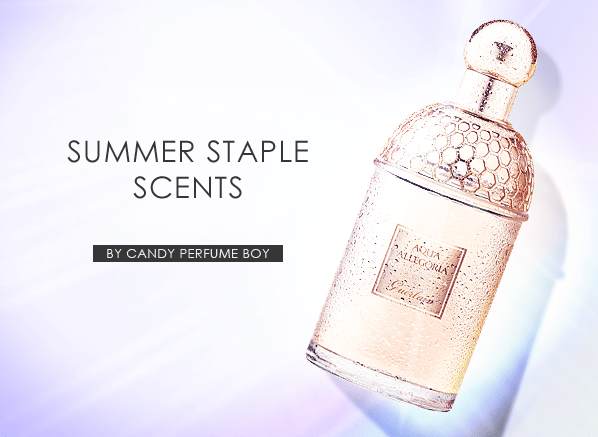 So if you’re looking to zest up your summer these staple scents are not to be missed! Image via Escentual.com. I post for Escentual as their fragrant expert/blogger. Posted in Escentual and tagged Aqua Allegoria Nerolia Bianca, Dior Homme, Dior Homme Cologne, Escentual, Escentual.com, Guerlain. Bookmark the permalink. For summer, my favorites are: Patou’s Eau de Patou, Chanel’s Cristalle, and Jicky eau de toilette. Excellent choices! I can see Cristalle being gorgeous in the summer.